Afternoons seem unending on branch-line stations in England in summer time. The spiked shelter prints an unmoving shadow on the platform, geraniums blaze, whitewashed stones assault the eye. 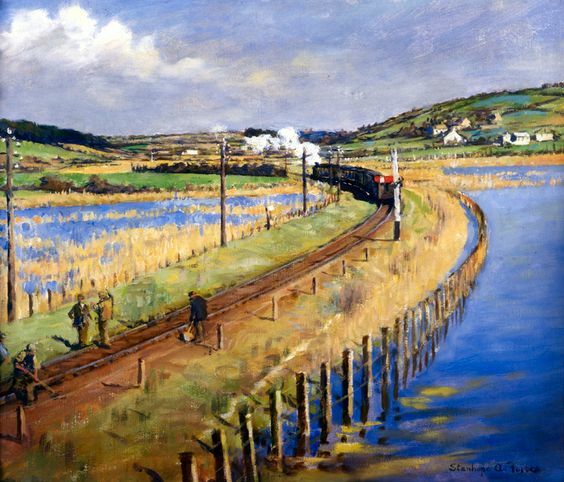 Such trains as come only add to the air of fantasy, to the idea of the scene being symbolic, or encountered at one level while suggesting another even more alienating. Once the train which had left them on the platform had drawn out, the man and the woman trod separately up and down, read time-tables in turn, were conscious of one another in the way that strangers are, when thrown together without a reason for conversation. A word or two would have put them at ease, but there were no words to say. The heat of the afternoon was beyond comment and could not draw them together as hailstones might have done. They had nothing to do, but to walk up and down or sit for a moment on the blisteringly-hot, slatted seat. 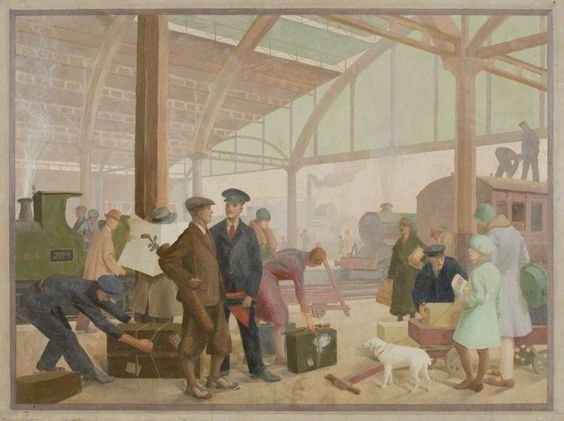 The novel begins in a railway station, a locomotive huffs, steam from a piston covers the opening of the chapter, a cloud of smoke hides part of the first paragraph. In the odour of the station there is a passing whiff of station café odour. There is someone looking through the befogged glass, he opens the glass door of the bar, everyting is misty, inside too, as if seen by near-sighted eyes, or eyes irritated by coal dust. The pages of the book are clouded like the windows of an old train, the cloud of smoke rests on the sentences. 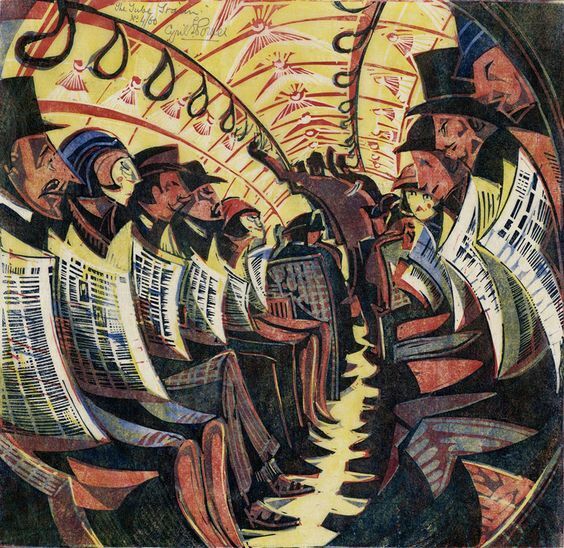 The train slows and lengthens, as we approach London, the centre, and my heart draws out too, in fear, in exaltation. I am about to meet–what? What extraordinary adventure awaits me, among these mail vans, these porters, these swarms of people calling taxis? I feel insignificant, lost, but exultant. With a soft shock we stop. I will let the others get before me. I will sit still one moment before I emerge into that chaos, that tumult. I will not anticipate what is to come. The huge uproar is in my ears. It sounds and resounds under this glass roof like the surge of a sea. We are cast down on the platform with our handbags. We are whirled asunder. My sense of self almost perishes; my contempt. I become drawn in, tossed down, thrown sky-high. I step on to the platform, grasping tightly all that I possess–one bag. The whistle of the engine came again. 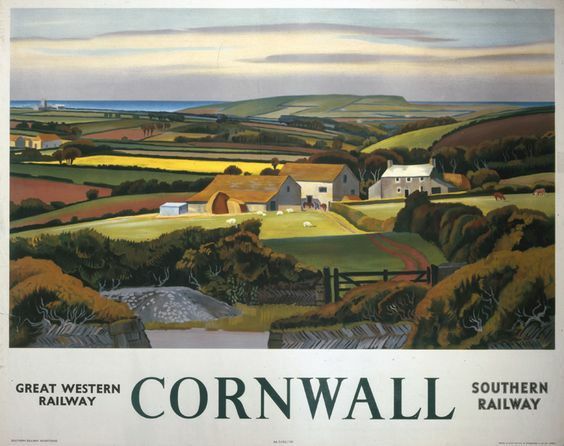 Poster produced for the Great Western Railway (GWR) and the Southern Railway (SR) to promote rail travel to Cornwall. I recognised that Elizabeth Taylor quote right away, I think it’s such an evocative opening. It is – it came into my head as soon as I started thinking about a railway collection. Another wonderful collection, Jane. 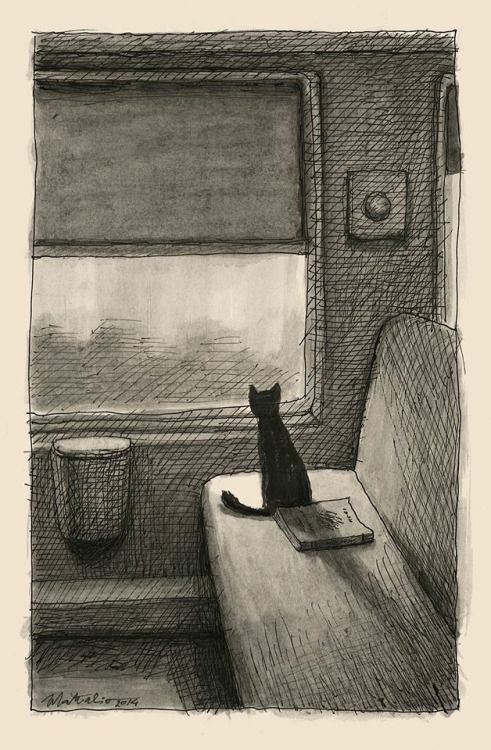 I love the combination of art and literature in these posts – the cat etching is particularly fetching! Thank you – I spotted the cat etching some time ago and wanted to use it, and so I’m very pleased it’s found its home. Thank you – now I’ve stepped back from reading the Calvino book I appreciate the quality of his prose all the more. A wonderful collection. That Taylor quote is beautiful. I think so too – ‘A Wreath of Roses’ is definitely a contender to be my favourite of her books. I tend to be an armchair traveler, but I love Edna’s sentiment. Loved the passages. The railway children was a children favourite of mine. The passage by Virginia Woolf, is it from The waves? This is wonderful! I love the poster of Cornwall and the bit of E Taylor at the beginning. Thank you for brightening our lives with these, they must take ages to put together. I do like your collection posts Jane. They always introduce me to books, poems and paintings I have not previously encountered. Thank you for this beautifully curated and illustrated entry. Your blog is a work of art, itself. I always get excited when I see you have a new entry.